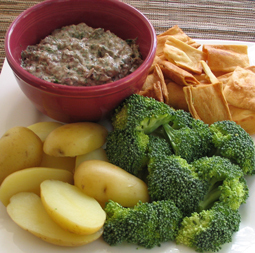 Anchovy & Kalamata Olive Dip - A recipe from Savor California, the online showcase for extraordinary gourmet foods and beverages from California. Blend all ingredients except mayonnaise in processor until finely chopped. Note: Can be prepared 3 days ahead. Cover and refrigerate. Serve with sliced boiled potatoes, crostini or vegetables.